We have french dip sandwiches pretty often at our house. Usually on a Monday, if we have had a roast for Sunday dinner. Last time we had french dip the kids loved it, but they had a hard time keeping the beef in their sandwich. This got me thinking and today I solved the problem by making french dip sandwiches in little pocket/roll form. 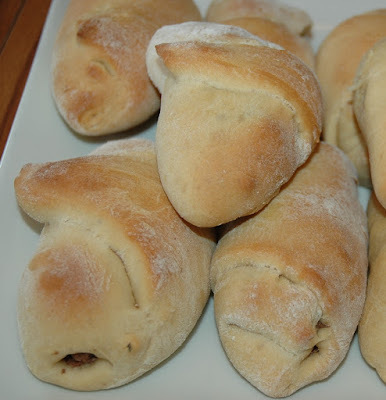 You can use any kind of bread dough, roll dough or even Pillsbury crescent roll dough would probably work. I used this recipe for roll dough since it doesn't need to rise much. I rolled the dough out and cut it into squares and also triangles (couldn't decide which shape I liked best). Spoon the roast beef (without any liquid) into roll and fold over (or roll up like a crescent roll). Bake at 350 for 15-20 minutes or until lightly browned. Serve with french dip "juice" (that's what my husband calls the beef broth) for dipping. If you haven't already, feel free to post your menu for the week (or what you made last week). Coming soon, that BBQ chicken recipe I mentioned the other day.